Euro Problems: The Greek debt issued rumble on and it looks increasingly likely they will get kicked out of (or choose to leave) the EU. Meanwhile the socialists have taken power in Portugal and a swing to the left in regional governments was outlined end May in Spain. European borrowing costs in the southern sun soaked states are rising sharply. France continues its stagnation with its social government having increased taxes and regulation over the last four years. Tens of thousands of migrants are crossing from war ravaged North Africa to escape violence. This is all affecting the confidence of the markets in southern states and driving money northwards to safe havens like Germany and the UK. Yes – after the Tories strengthened their government after the General Election in May 2015, not only does this mark t he continuation of the UK as a safe haven, but the UK is actually far safer than it has been for the last five years now the Coalition has turned into a majority Tory government. The Tories will be able to drive business friendly legislation through that will help all private investors and boost the property market still further. Migrants: As the number of jobs increase, more migrants will arrive from mainland Europe and other countries which will further drive economic growth in the UK, particularly in areas close to London and southern England. 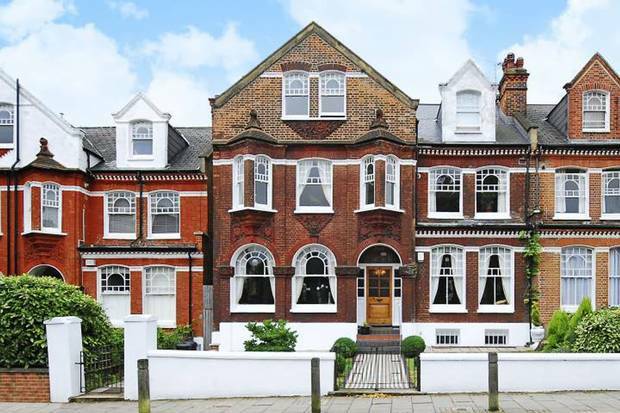 House Price Boom: We expect property prices to start rising sharply in the Autumn as mortgage rates drop, inflation stays low, employment booms and inward investment into London booms. Some of the youngest and most talented people in the world are moving to London to set up businesses and we expect property prices to rise with this trend particularly in London. The outlook looks particularly good for the next 12 months now the Tories have a majority. We expect prices to continue moving up through the summer, accelerate in the Autumn and when the City bonuses hit at Christmas, spill over into the New Year and beyond. Oil Prices: Whenever oil prices are suppressed, inflation stays low, mortgage rates stay low, growth accelerates and house prices boom. The financial markets price in their confidence with the way the Tories manage the economy by setting interest rates at very low levels - because of lower perceived risks. The oil price crash from $110/bbl in June 2014 to $45/bbl by Jan 2016 - only rising to $58/bbl in May has given western oil importing nation's economies a big boost. It makes paper assets more valuable - property, art, wine - whilst commodity prices (gas, oil, metals) stay suppressed. This is also particularly good for consumer businesses, airlines, tourism and high-tech businesses - this all benefits London. Low oil prices normally mean high house prices in oil intensive, oil importing nations like the UK. Lack of Supply Endemic: Regardless of who got into power in the UK, the UK building business is not set up to build anywhere near the required 250,000 properties a year. Instead, building levels dropped to 120,000 a year in Q1 2015 because of the threat of a Labour victory early 2015. There should be a slight recovery, but we can say categorically that supply will not keep with demand in any given year in the next 5 years, as the population booms, inward migration stays at high levels and few people leave the UK – this is also because employment opportunities are strong in the UK and weak in most other EU countries. Population Boom: The UK's population is booming when it comes to the net death-birth rate - which is a +250,000 a year. On top of this, there is a net immigration of 590,000 people and a net emigration of -310,000 people - which means an additional net +280,000 people a year arriving. So the net total population increase per year is running at around 530,000 people. Hence the population is growing at the pace of the city of Cardiff each year - with only 120,000 properties being built a year. No wander prices are rising. This trend started in the "Blair Years" and continued at a similar pace under the last Tory Coalition. Green Light For Investment: For all property investors – it’s a green light for investment – for capital value increases and higher rental prices - as the housing crisis continues. This is no surprize, look back at our Special Reports for the last 10 years and they have a similar theme – lack of supply and projected strong demand from an expanding population. 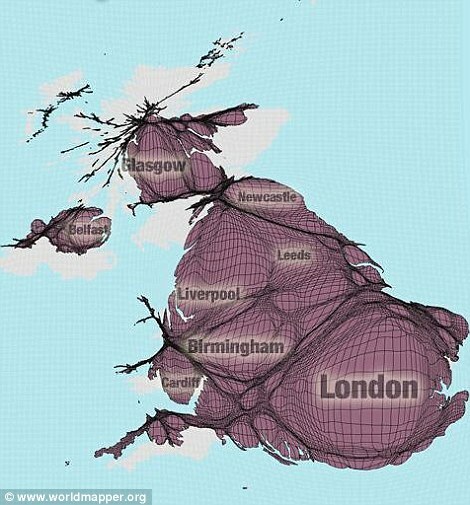 Also don’t forget most migrants have larger families than average and these feeds through to expanding populations in the major cities like London and many Midland and northern cities. Indigenous UK nationals are also having larger families as confidence returns after the 2008 crash. Young Talented People: Its worth considering for the longer term where all th ese young highly educated talented people are settling to build businesses. The biggest concentration is around Shoreditch (Tech City, or Silicon Roundabout). A rather desolate area close to Brick Lane, NE of the City. Prices have skyrocketed in the last ten years, but we expect more – as all these young business owners make millions from media-high tech businesses and want to live with their new young families in the area their businesses are thriving in. Hence south Hackney, Whitechapel, Shoreditch, Hackney Wick will we believe see prices rise sharply in the next decade. When people look back to prices in the early 1980s, they will see an unbelievable rise. Already a 4 bedroom house in Hackney in 1982 could be bought for £40,000 - similar houses are now selling for £1 million. In ten years time, this is likely to be £2 million or more. Brexit: Opinion polls, for what they are worth, currently predict that 70% of the UK population would vote to stay in the EU if a referendum was held now. We cant believe there would be such a massive swing to an exit vote, so despite all the gloom – we think the vote will be to stay in the EU - after some concessions are agreed this year by Prime Minster Cameron, strengthening the reason to stay. Hence we do not see an EU exit as a major risk. Scottish Referendum: We also don’t see this as a key significant risk to Eng lish investors. If Scotland wants another Referendum – they will probably get it. Then if they can choose to stay or leave the union - if they decided to leave, it would be economic chaos for Scotland - financial capital flight, higher borrowing costs, possible forces EU exit because of high deficits and a declining economy as large businesses pulled out. The North Sea is in terminal decline with low oil prices that would severely impact the Scottish economy if it was independent. Hence if the Scottish voted for independence - that would lose out enormously - though we think it would be broadly neutral for England, Wales and North Ireland. Scotland is costing the UK tax payer a lot currently in subsidies (e.g. University fees for Scottish students are £3000, whilst they are £9000 for English students in England). For property investors in England, another Referendum won’t make much difference, though for Scottish property investors in Scotland, a UK exit would be very bad news for property prices, rental prices would decline and overall demand would drop. We believe foreign investors pulled their money from the country – and moved south. 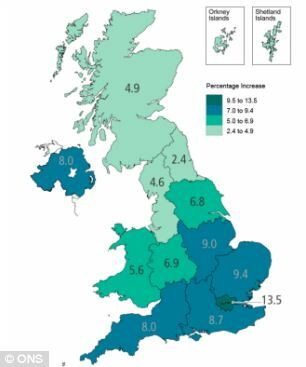 Its worth reflecting on the Scottish economy making up only 2.5% of UK GDP with 5% of the population and a land mass of mainly non productive land about the same since as England. as oil and gas revenues continued to decline, the Scottish economy on its own would have a bleak future. 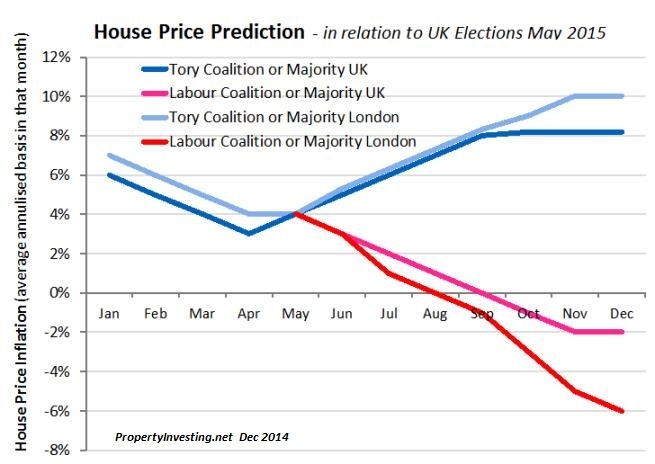 Enclose below just for reference is our predictions for UK house prices depending on the Election result form Dec 2014.